Suicide bombings at bus stations in two major commercial centres in northern Nigeria have killed at least 27 people, police and hospital sources say. A bomber first struck in Potiskum, and hours later a second attack took place in Kano, the main northern city. Hospital sources said 17 people were killed in Potiskum while police put the number of dead in Kano at 10. Nigeria's President Goodluck Jonathan blamed militant Islamist group Boko Haram for the bombings. Its insurgency would "soon be over", as regional forces recapture territory from the group, he said in a statement. 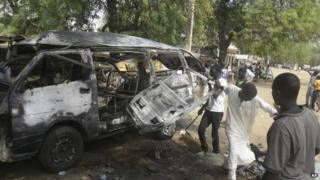 Boko Haram has not yet commented on the attacks. On Monday, Nigeria's military said air strikes were being carried out against the group in several areas, including Gwoza town where it first declared a caliphate last year, Reuters news agency reports. A witness to the Potiskum blast told the BBC Hausa service that the bomber blew himself up while trying to board a bus at the Dan-Borno bus station. The bus was completely destroyed and other vehicles were also damaged in the explosion, he said. Hospital sources said 13 corpses were brought to the mortuary, but the number of dead rose to 17 after four people who had been admitted for treatment died of their wounds. More than 30 people were injured in the explosion, the sources added. In Kano, two male suicide bombers alighted from a vehicle at the Kano Line bus station, before detonating themselves, police spokesman Magaji Musa Majiya told the BBC. Kano is about 360km (223 miles) from Potiskum, the main commercial hub in Yobe state. Boko Haram has repeatedly targeted both places, despite a state of emergency being in force in Yobe. On Sunday, a young girl with explosives strapped to her killed five people and wounded dozens at a security checkpoint outside a market in Potiskum. Boko Haram now controls vast swathes of north-east Nigeria and has displaced more than three million people. The mounting threat of the Islamist insurgency has already led to the postponement of February's presidential elections, with the vote now due to take place on 28 March. The delay is designed to give the Nigerian military time to re-establish its presence in the north-east. However, opponents of President Jonathan have claimed that the delay is actually a political tactic. The group is under increased pressure from the Nigerian troops as well as those of Chad, Niger, and Cameroon. Boko Haram crisis: Is the Nigerian army failing? Who are Nigeria's Boko Haram Islamist group?